How to convert MS Office PowerPoint documents of PPT to WMF? In fact, converting ppt to wmf is not hard if you can use docPrint Document Converter Professional as the assistant. The whole conversion only need several clicks and some inputs. This article aims at converting ppt to wmf with one application of docPrint Document Converter Professional, before knowing the steps, you should know what is docPrint Document Converter Professional first. docPrint Document Converter Professional is a software product that dynamically converts Word, Excel, PowerPoint, WordPerfect, AutoCAD DWG, PostScript, Adobe Acrobat PDF and many other document types to Adobe Acrobat PDF, PostScript, EPS, XPS, PCL, JPEG, TIFF, PNG, PCX, EMF, WMF, GIF, TGA, PIC, PCD and BMP formats. With docPrint Document Converter Professional you can convert your documents from ppt to wmf format files easily. The application works in GUI application, command line application and virtual printer application. The three applications can realize their functions respectively, but more or less the same. For example, you can use the GUI application to make batch conversion, use the command line application to develop software, use the virtual printer to save paper and ink. But the virtual printer is not only a printer, it is also a powerful document converter with friendly interface. It is easy to use just by printing the PPT document to the printer. You can see how to convert ppt to wmf with the printer docPrint in the contents below. Please open a PPT document and click “File”—“Print” to open “Print” dialog box. 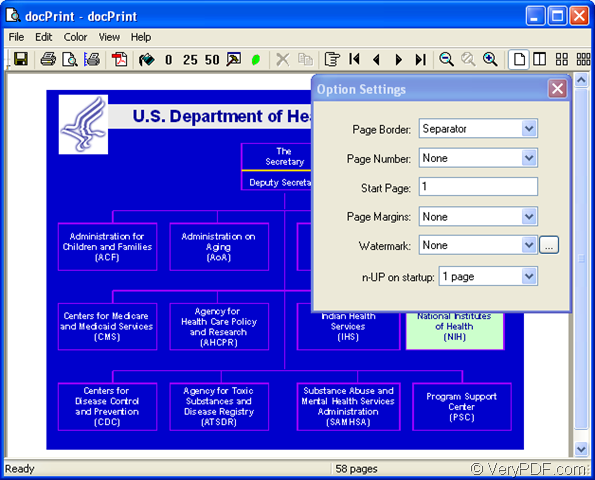 In this dialog box, you can choose “docPrint” as the current printer in “Printer” combo box. Then please click “Print” button. If you don’t like this method, please use the hot key “Ctrl”+ “P” to open “Print” dialog box. But if docPrint is the default printer, it will be easier. You just need to right click the PPT document and click “print” option in dropdown list. 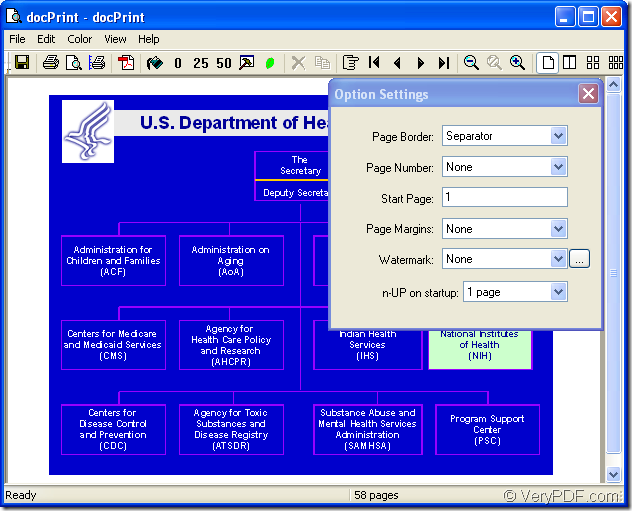 You will see the interface of docPrint next. Please see it in Figure1. In this interface, you have several ways to open the next dialog box which is titled “Save As”. There are three ways listed below and if you have other good ideas, welcome to share with us. Please click “File”—“Save as” to open “Save As” dialog box. Use the hot key “Ctrl”+ “S”. Please see the popup “Save As” dialog box in Figure2. There are some combo boxes and an edit box in it. To complete all the operations, you should follow the steps below. You should specify the location for the target files in “Save in” combo box. Input the name for the target files in “File name” edit box. Choose the right output format for the target files in “Save as type” combo box. Click “Save” button to save all the changes. After clicking on “Save” button, you will see a green progress bar appear at the bottom of docPrint interface and the progress bar will be empty when the conversion from ppt to wmf is over. If you want to read more articles about docPrint, please visit the blog VeryPDF Knowledge Base. How to convert Webpage to MIFF? This entry was posted in docPrint Pro and tagged ppt to wmf. Bookmark the permalink.